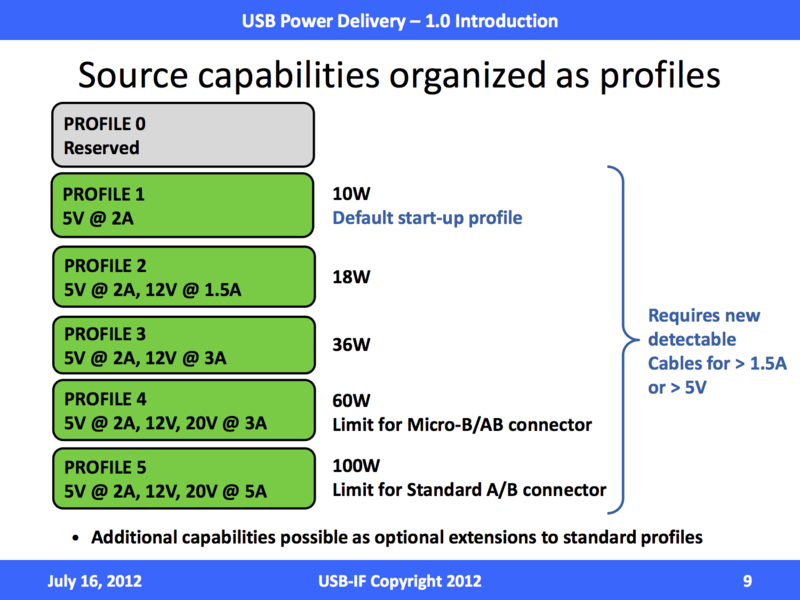 I stopped by the USB Implementers Forum booth, where they had both an interesting non-final demonstration of the new USB Power Delivery specification and some news about the new 10 Gbps USB 3.0 development specification. First, the 10 Gbps USB 3.0 development announcement stipulates continued use of the same cables and connectors for higher throughput, and although there will be a 10 Gbps certification program for cables the USB-IF expects almost all but the lowest end cables to pass without any reworking. I'm told that the newer revision enables 10 Gbps by using more efficient coding and also enables improved power efficiency. The standard is in development presently and should be completed by the middle of the year. It will then take the normal development cycle for silicon and controllers to make it onto the market. The USB 3.0 specification stipulates a meter long cable that's entirely passive, as opposed to other active solutions on the market presently. Longer lengths will require active componentry. I also wasn't aware but earlier this year the USB-IF finished the SSIC (SuperSpeed Inter Chip) specification which is essentially the USB 3.0 analog of HSIC (HighSpeed Inter Chip - USB 2.0). This is hugely important for smartphones and tablets where the limits of HSIC are already being encroached upon or actively hit with certain 2x2 802.11a/b/g/n combos, and will be a problem with 802.11ac combos. In addition I fully expect to see future SoCs implement SSIC for use with both these 802.11ac combos and faster 3GPP Release 10 or Category 4 basebands where there is a lot of attention as throughput continues to increase. Next up was a demonstration of the USB Power Delivery (PD1.0) specification working in conjunction with display driving. The USB-IF modified a Lenovo X300 notebook to accept power through USB 3.0 and the PD specification, and used a power delivery mechanism on the middle display to both power it, and the notebook with 65W. At the end of the daisy chain was a thumb drive plugged into the last monitor's hub which was available to read on the notebook. The X300 was running Vista oddly enough, which took a while to enumerate and connect to the other two displays, but did indeed simultaneously drive both a 1080p and 2048x1156 display through a daisy chain with good fluidity for a non-final demo. This combination of specifications is clearly USB-IF's response to Thunderbolt, and looks like a possibly even more impressive solution thanks to the ability to simultaneously drive the displays and charge the notebook over one cable. The latest version of HDMI supports 8.16Gbps of real bandwidth. Therefore 10Gbps Ethernet that works over cat 5e/6 is more than enough. You're also a bit off on the specs. 8.16 Gbps is the throughput after removing overhead. With overhead, they're at 10.2 Gbps, and HDMI 2.0 is expected to bump that up to 18 Gbps. Yes I'm looking forward to all the broken connectors because it will be much easier to solder a USB port. Why hasn't anyone created a magnetic or otherwise unbreakable solution for PCs yet? The big advantage of Thunderbolt is that it actually passes video straight over the cable, whereas with USB you need a separate display adapter (here they're using DisplayLink). In the video, it seems the left monitor might have a DisplayLink controller built in, and the right monitor has a controller taped to the back. DisplayLink has advanced quite a bit, but it's still not a native display connection. I'm actually driving a 27" 1440p LCD via DisplayPort from an HP USB 3.0 port replicator that has a DisplayLink chip inside (since HDMI 1.3 and MicroHDMI can't do more than 1080p). Performance is not bad with a high-end quad-core i7 laptop, but power users can tell that something's up-- and when connected to my i7 ultrabook (not exactly a $200 netbook), things start getting messy (feels like using an RDP connection to some PC).